President Trump's decision to withdraw from the Paris climate deal could be a step back for U.S. energy job growth. Trump slammed the global agreement as bad for U.S. jobs despite its widespread support from corporate America. That's because it cracks down on coal and other old school energy sectors. But the climate goals would also stand to promote job growth in cleaner industries like wind, solar and natural gas. 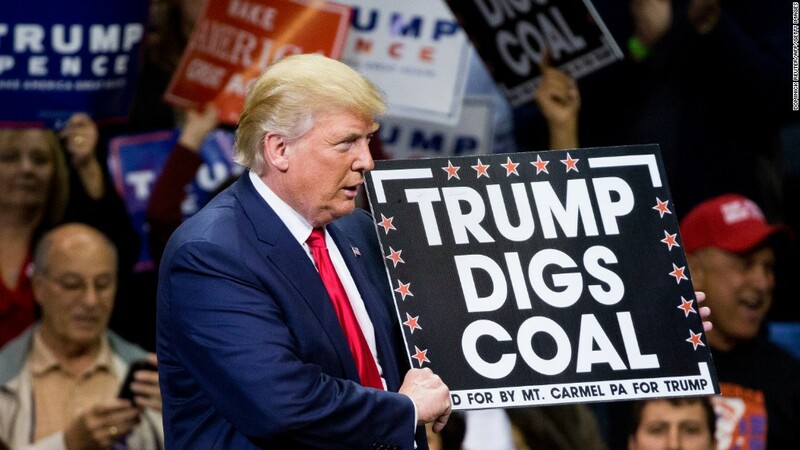 Already, job growth in those cleaner energies is outpacing that of coal and other big carbon-emitting fuels in the U.S.
For example, the natural gas industry employs 362,000 workers, solar 374,000 and wind has 102,000 jobs, according to an Energy Department report. Coal companies employ 160,000 workers -- a number which has been in decline for decades. Experts say Trump will impede but not fully interrupt that job trend. "If Trump withdraws from the Paris agreement it can slow that momentum but it will not stop it," says Karl Hausker, senior fellow at the World Resources Institute. "Even if we were to withdraw from Paris, we wouldn't see a resurgence of coal jobs." By contrast, solar industry job growth expanded 17 times faster last year than overall U.S. job growth. Meanwhile coal employment barely grew last year, adding less than 2,000 jobs. However, some Republicans say the Paris agreement would be a job killer in the U.S. For instance, Senator Rand Paul of Kentucky claims the deal would cost 6.5 million U.S. jobs by the year 2040. Paul cited a study by the Center for Policy Research. That means the U.S. would lose about 283,000 jobs a year between now and 2040. That may sound like a lot of jobs but remember that the U.S. has added over 2 million jobs in each of the last three years. Trump administration officials lobbying the president to drop the deal have echoed a similar sentiment. The Paris agreement is "anti-jobs and anti-growth," Environmental Protection Agency director Scott Pruitt told ABC in March. But some oil CEOs, such as ExxonMobil's Darren Woods, are coming out in favor of the Paris agreement, arguing its the best attempt at addressing the challenges of global climate change. It would also benefit natural gas, an area Exxon is pouring a lot of its resources into. Other companies supporting the deal include Microsoft (MSFT), Apple (AAPL), Starbucks (SBUX), Chevron (CVX), Gap (GPS), Nike (NKE), Google (GOOG), Adidas (ADDDF) and L'Oreal (LRLCF). International advocates say the agreement is a clear job creator for the U.S.
"Even the coal companies of Kentucky understand that the future lies in solar," United Nations environmental executive director Erik Solheim told NPR Wednesday. The Paris deal "is a great job creator." --Matt Egan and Alanna Petroff contributed reporting. An earlier version of this story misstated the number of U.S. coal jobs.